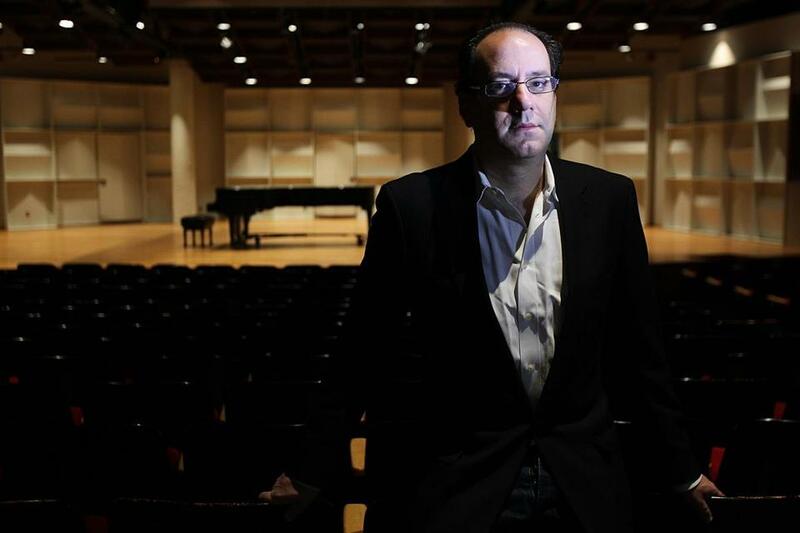 At Boston University’s CFA Concert Hall, Joshua Fineberg, the inaugural director of BU’s Center for New Music, has collaboration and coherence as his goals. New music is one thing Boston is not short on. Thanks in no small part to the plethora of local universities and conservatories, there is a near-constant clutter of activity, with various organizations, ensembles, and composers vying for listeners’ open ears. You might wonder, then, what Boston University’s recently created Center for New Music hopes to add to the mix. Composer Joshua Fineberg, the center’s inaugural director, says its purpose is less about adding one more strand to an already frenetic scene than it is about lending some coherence, some collaborative glue, to it. Instead, Fineberg decided to reach out to other groups and work collaboratively on projects where both sides could benefit. As an example, he mentioned the composer Roger Reynolds, who is in residence this fall at Harvard University. Fineberg brought him over to BU to give a talk, “which we would have done anyway.” But he also asked violinist Gabriela Diaz, who recently played a Reynolds piece with the Callithumpian Consort, to play a solo piece by Reynolds at his talk. Then there is the upcoming three-week residency of Salvatore Sciarrino, a luminary of the European avant-garde. According to Fineberg, Sciarrino rarely leaves his home in the Italian town of Cittá di Castello and does not have Internet access, making the logistics of setting up his spring residency especially challenging. Still, given Sciarrino’s reputation, it’s a coup for the BU center, and he will do plenty there. But Fineberg also reached out to other groups. Sound Icon, the young new-music sinfonietta, will give a rare performance of Sciarrino’s “Infinito Nero,” a piece based on the ecstatic visions of St. Maria Maddalena de’ Pazzi, at the Institute of Contemporary Art on Feb. 22. He also discovered that the JACK Quartet, a highly talented group that specializes in avant-garde music, would be working with the Harvard Group for New Music this fall, and booked them for a BU concert on Feb. 26. New music director Ronald Feldman rehearses the Longwood Symphony Orchestra at the Boston Latin School this week. Fineberg also spoke to the Boston Modern Orchestra Project about including Sciarrino pieces on one of its club concerts. But, as BMOP artistic director Gil Rose wrote in an e-mail, the timing didn’t work out. Asked to name a recent event that made him especially hopeful for Boston’s new-music scene, Fineberg mentioned Sound Icon’s performance of Georg Friedrich Haas’s “in vain” at the ICA earlier this year. For him, that landmark event represented the coming together of a venue not normally associated with concert music; a young, ambitious group; and a piece both epochally important and fiendishly difficult. Earlier this week, Boston University also announced the creation of a Center for Early Music Studies. This one is dedicated to the “performance, scholarship, and new pedagogical practices involving music of the Medieval, Renaissance, Baroque, and Classical periods,” the school said. The Center’s inaugural ensemble in residence will be the vocal group Blue Heron, whose music director, Scott Metcalfe, will be one of the Center’s co-directors. Saturday brings the Longwood Symphony Orchestra’s first concert under its new music director, Ronald Feldman. Feldman’s appointment was announced in July; the previous month, he led the orchestra in a concert that included Brahms’s Second Symphony. He succeeds Jonathan McPhee, who left the LSO at the end of the 2010-11 season. Feldman has had a lengthy career, beginning with the Boston Symphony Orchestra, which he joined as a cellist in 1967 at 19. His first conducting post was at the Mystic Valley Chamber Orchestra, known today as the New England Philharmonic. 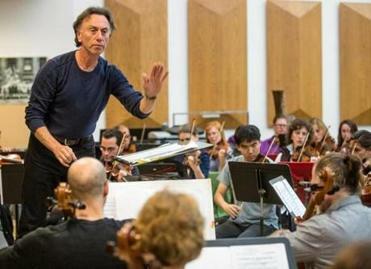 During the 1980s, he was John Williams’s assistant at the Boston Pops. He retired from the BSO in 2001 and is now artist in residence at Williams College.